From May 1 through July 11, 2018, my Great Blue Heron photographs once again graced the walls of the lobby and theater in a free one-woman show at the Summer Street Gallery, of The Center for Arts in Natick. If you’re in the Boston or Metro West area, please stop by to see the Great Blue Herons. As always, many of the photos were taken on the waterways of the Charles River watershed. The gallery is open whenever the box office is open, so please check hours here. Thanks again to Paula for her earlier WPC: Black & White Sunday: Traces of the Past. This bridge and tunnel are from days gone by, using ingenious technology of the earlier era. Thanks to Erica V and WordPress for the recent WPC: Place in the World. My favorite place is where the Herons are, of course it is. And the Herons? Their place is near the water, but also on the gallery walls and my blog. How else can I share them with you? Thanks also to Ben H and WordPress for their WPC Challenge: Liquid. The Herons are drawn to water, as am I. Through July 13, 2017 I was a Featured Artist at the Five Crows Gallery in Natick, MA. Drop in and see the work of the many wonderfully creative artists who show there when you’re in the area. Five Crows is on FaceBook. This is a politics-free space. You won’t hear me advancing any political agenda. The Great Blue Herons, on the other hand, want to remind everyone – regardless of party affiliation or lack thereof – to vote when and where you can so that your voice can be heard. Our Primary is today. The ambience in our Town Hall seems to have inspired the Great Blue Herons to speak up about the importance of voting. Guys, you said there’s a Labor Day Party! Guys? Where are you? I’m ready for the party! File this under silly fun with Herons! Thanks to Cee N and WordPress for her Odd Ball Challenge. Welcome back from your vacation, Cee! Like many photographers, I don’t always know what I’ve seen until the images have been downloaded. Adult male Great Blue Herons are known for chasing off interlopers when protecting their territory. They chase off other males, they chase off their mates once breeding season is over, and they even chase off their own offspring once they’ve fledged. And so that day I assumed it was a mature adult male Great Blue that was strutting down the shoreline. The territorial display was unmistakable, and I expected the adult to very quickly close ground and chase off the Fledgling. Previous encounters have had my heart pounding in my throat, watching to see if the Great Blue Heron Fledgling would escape a territorial adult. In the photo sequence above, the Fledgling leapt from the branch as the adult climbed closer and closer, and landed on the eastern shore about 50 yards away. Uncharacteristically, though, the adult stopped at the top of the branch, and stood stock-still, staring at the Fledgling for more than 5 minutes without making his move. All the while, the Fledgling looked north then south, perhaps scoping out an escape route. And then flew directly in front of the Fledgling. Without stopping, without threatening, the adult made a lazy turn to the west and circled back towards the far shore. Three minutes after that, the Fledgling took flight, following the same path, and caught up with the adult on the southern shoreline. They peaceably co-existed there under the tree canopy for quite a while that day, and I obsrved this same pair of Great Blues together in various locations over the course of the following two weeks. It was a delight to watch them from a natural hide on the lake shore. So, at the end of the day, I was wrong to expect extreme territorial behavior. I’m not at all surprised that these two magnificent birds shared the lake together. Sometimes being wrong is good. Watch this space for news of my next one-woman-all-herons-photography show for the months of September and October. Thanks to Cee N and WordPress for her Odd Ball Challenge. Hope you are enjoying your vacation, Cee! Thanks to Paula for her Thursday’s Special: Iconic. I think there is often a very fine line between iconic and cliched. 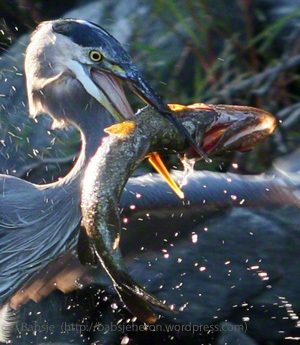 Some of the Heron photographs are iconic, without being cliched. The bridge in this photo panel was constructed in the mid 19th century, around the same time that the cyanotype process came into vogue. There is a palpable timelessness to this location, and I imagined how it would have been rendered by a 19th century photographer, perhaps capturing an ancestor of one of the Great Blue Herons that frequent the area today. I chose this 19th century style cyanoprint series for the exhibit at TCAN because the Summer Street Gallery, itself, is from that same 19th century period. Today and tomorrow are the closing days of my free one-woman Great Blue Heron photography show at the Summer Street Gallery, of The Center for Arts in Natick. Since 2001, the Center for Arts Natick has been housed in the circa 1875 historic Central Fire House, where the Summer Street Gallery provides an opportunity for accomplished visual artists in the region to have their work prominently displayed for TCAN’s diverse and loyal audience. 141 years after the Firehouse was first constructed in 1875, TCAN installed an intimate new venue on the second floor of the historic firehouse for concerts, movies, and events, with new professional gallery space for the visual arts. 543 backers pledged $103,420 in a Kickstater campaign that helped bring this project to life. If you’re in the Boston or Metro West area, please stop by to see the Great Blue Herons. Many of the photos in the exhibit are being shown for the first time, and do not appear on the blog. As always, many of the photos were taken on the waterways of the Charles River watershed. The gallery is open whenever the box office is open, so please check hours here. And who knows, maybe I’ll see you there one day. Thanks also to Ben H and WordPress for this week’s WPC Challenge: Liquid. The Herons are drawn to water, as am I.
I learned long ago to open myself, and my eyes and camera, to whatever experiences and sights the waters bring forth at any moment. My emotions have run the gamut from excitement, to apprehension, to alarm, to amazement, to curiosity, to anxiety, to happiness, and (thankfully very rarely) to sadness. Close readers of this blog are aware of the protectiveness I feel towards the Great Blue Herons. The stories in this retrospective post all have happy endings. I like happy endings. Once again, many thanks to the creative team at WordPress who have made it possible to share the Great Blue Herons here over the past 5 years. Close to the island, I found no crumpled birds littering the island floor, no sodden nestlings floating in the waters nearby. Click here for Freshly Fledged. And what the taxi driver told me next made the hair stand up on the back of my neck… That day, he came across a great blue heron caught in fishing line on one of the pine logs. The line was caught in the heron’s wing and foot, and the heron was struggling but obviously very weakened by the time he got there. Click here for The Taxi Driver’s Tale. Doesn’t this Great Blue Heron holding a seagull feather bring to mind a friendly dog playfully carrying his favorite toy back to you? At the time, I wanted to say to her, “Who’s a good girl? You are! You are a good girl!” because the way she pranced the length of the submerged log seemed so playful – at first. And then I realized it was another case of tool use by Herons. Click here for Who’s a good Great Blue Heron?. There was reason to be concerned for the newly-fledged herons. Would they survive the migration south, the winter, and the migration back? If so, would they remember this lake where they were born and make it their home once again? Click here for Full Circle: Freshly Fledged. I heard them – boisterous and happy – before I felt their wake, and I felt their wake before I saw them, and when I saw them the first thing I saw was the captain’s over-size gang hat. And the second thing I saw was their telegraphed trajectory – heading straight for the small nesting island. There was no doubt about that, and no doubt that they would make landfall, and no doubt that the adult male would flee the nest and abandon the chicks. Click here for Pequeño: Stranger in a Strange Land . Thanks to Krista S and WordPress for last week’s final WPC: All Time Favorites. Many thanks to the creative team at WordPress who have made sharing the Great Blue Herons here over the past 5 years possible. Thanks to Paula and WordPress for her Thursday’S Special: Pick A Word In June. The Fledgling Great Blue Heron is a ‘nascent’ GBH, freshly out of the nest. Thanks again to Erica V and WordPress for the recent WPC: Place in the World. My favorite place in the world is on the water with the beloved Great Blue Herons. There are ways of seeing and there are ways of seeing. The way of the photographer need not be only the way of gadgetry and technology and calculations. The way of mindful seeing can open the lens as wide as one’s imagination. As a nature photographer, spending time on the water with the Great Blue Herons is a meditation in and of itself. Capturing a photo that conveys the experience in the moment is a pleasing bonus. And then being able to share my love for these magnificent birds with others via blog posts or at galleries where I show is the icing on the cake. I think that is a universal for artists – there is the joy of creating , and then the act of releasing the art into the world, followed by watching as a fly on the wall as others respond to the art – whether music or painting or writings – whatever the medium. Many thanks to the creative team at WordPress who have made sharing the Great Blue Herons here over the past 5 years possible. How long she was under, I cannot say, I lost track of time, but when she resurfaced, her prize catch struggled mightily, the curve of its back straining left then right, scales and fins glistening. It was an epic fight. And when she struggled to shore under the weight of her prey, I’m not sure whose eyes held more surprise — mine, hers, or the one that didn’t get away. Click here for The One that Didn’t Get Away. The day of my artist reception at Mass Audubon, I spent some time sitting outside on a bench before going inside to meet & greet gallery visitors. I sat there under the trees, composing myself and enjoying the dappled sunlight when suddenly I felt it. Plop! Click here for Pictures at an Exhibition. Time stood still that day in the secluded cove. The rumbling of a lumbering Diplodocus moving towards the tallest stand of trees echoed over the ridge. A school of Leedsichthys searched for plankton in the watery depths, swishing this way and that. Overhead, a flock of Archaeopteryx flapped and wheeled, warming their wings in the late day sunlight. Click here for It’s a Pterodactyl!. She flew low and slow, the water’s surface mere inches below her wing tips. I watched wordlessly from the eastern shore, taking in her grace and economy of movement. An engineer friend once explained to me that birds fly so close to the water because it gives them maximum air resistance for those huge wings. Click here for Wordlessly Watching . Are there any artists who don’t fall in love with their models, their muses? Click here for Artists and Models. Thanks to Krista S and WordPress for this week’s final WPC: All Time Favorites. Joining the chorus of folks who will miss the weekly and daily prompts, and the creative team at WordPress who have made them possible for all those years. Thanks for your enthusiasm and encouragement everyone. The artist’s job is to get the audience to care about your obsessions. Frequent visitors to this blog know that most of my photos are taken from the waters of the Charles River Watershed area. There are moments of absolute stillness and peace there on the water, and mindful moments imbued with wonder. There’s love and concern for the herons I’ve come to know over the years. Sometimes there’s a touch of humor, and other times a sense of curiosity and a wanting to learn more. Sometimes the photos I take are capital A art, other times merely nature photos from the field. Some of the stories below are personal anecdotes about encounters with Great Blue Herons, some have more scientific value than others, such as the Great Blue Heron using a twig as a tool. Some have more artistic merit than others and some are quirky and just for fun. Using a twig to attract fish. Crows are the master tool users of the bird world, but as this first-hand experience shows, herons are smart birds, too. In this sequence showing tool use by herons, the yearling Great Blue Heron wiggles a twig in the water to attract the fish. Click here for Who You Calling a Birdbrain?. The small heron turned back and forth, from alpha heron to human, weighing, weighing the greater of the dangers, the lesser of the evils: alpha heron vs woman. And then he made his move. Click here for The Lesser of Evils. It is not so rare to see a human in the cove, and there’s one who sometimes watches me when I’m down at the end, where its more brook than cove. You know the place. She thinks I’m not aware of her presence, but I am. I just let her think that. Click here for Brown Bag Lunch in the Cove. It took them quite a while to position the branch, and there were a few cliffhanger moments as the branch nearly escaped their beaks’ grasp and almost plummets to the island floor 70 feet below. Click here for Our Love must be Some Kind of Blind Love. Fearlessly, fleet of wing and nimble of foot, he practiced take offs and landings from the tip of that branch. My heart was in my throat as I watched, because it was such a long way down and he was still a beginner. And his nest mate? I imagined him thinking, “My turn, I want my turn now!” Click here for Fleet of Wing, Nimble of Foot. Thanks to Jen H and WordPress for this week’s WPC Challenge: Twisted. The Herons building their nest twisted and turned almost acrobatically as they attempted to position that exceptionally long branch into their nest. Thanks again to Erica V and WordPress for thei recent WPC: Place in the World. My favorite place in the world is on the water with the beloved Great Blue Herons. From May 1 through July 10, 2018, my Great Blue Heron photographs once again grace the walls of the lobby and theater in a free one-woman show at the Summer Street Gallery, of The Center for Arts in Natick. I would rather learn from one bird how to sing than to teach 10,000 stars how not to dance. On the first outing each spring, I am reminded that there is an art to seeing the very familiar with fresh eyes, where no two days are the same. I am reminded to not take for granted the usual wildlife and their commonplace behaviors, to not fall into the trap of my own routines. The inaugural circumnavigation of the lake is fast approaching – though not quite fast enough for me this spring. Will I see this Great Blue Heron once again this year? Have I ever mentioned that no two years are the same? Thanks to Krista S and WordPress for their recent WPC Challenge: I’d Rather Be. I’d rather be out, camera in hand, today, but it is still too cold for kayaking. Soon. Soon I keep telling myself. Soon. Thanks to Cheri and WordPress for the recent WPC: Favorite Place. My favorite place is where the Herons are, of course it is. Thanks to Paula for her Thursday’s Special: Verdant. The green of the bough in the faint mist that morning was verdant. Thanks to Cee for her recent Photo Challenge: Birds. Once again, I am very tardy, Cee, but I couldn’t resist. Your challenges are inspiring. Watch this space for news of my next one-woman photography show for the months of May and June, 2018.